Which team in the Environment Agency will carry out the Audits? Audits will be arranged by the relevant National Environment Agency team and carried out with assistance of local Area staff. Staff carrying out audits will be fully conversant with relevant waste legislation and the content and aims of the DoWCoP. For consistency purposes any queries on interpretation including issues such as bulking and consolidation will be resolved in consultation with the National team. Most audits will be undertaken within 6 months of the submission of a Declaration. However audits can be triggered at a later date if complaints are received about a site or a pollution incident is subsequently reported. A risk based decision will be taken as to whether to retrospectively enforce the requirements for an environmental permit if problems are found at any site. Can the DoWCoP be applied to fixed Soil Treatment Facilities? Yes - See section A3.3 Fixed Soil Treatment Facilities of the Version 2 of the DoWCoP. Could the DoWCoP be used to bring material such as Pulverised Fuel Ash (PFA) on to a site, for example a former mine. Potentially: The Pulverised Fuel Ash would have to constitute made-ground and be excavated and re-used as earthworks materials as part of a defined Hub and Cluster development. However the filling of mineral voids is commonly regarded by the Environment Agency as a landfilling activity which would rule out the use of the DoWCoP. What about the case where impact to groundwater remains after human health issues are dealt with, but Environment Agency takes the view that it is unreasonable to require further work (e.g. aquifer already compromised). Would the material strictly not be suitable for use? Suitability is determined on a site by site basis with reference to the achievement of agreed risk based targets which take into account the environmental setting of the site. Why does the methodology behind the assessment of “suitability” differ when considering the three scenarios of use on Site of Origin, Direct Transfer and Hub & Cluster within the DoWCoP? Why isn’t suitability defined by a simple risk assessment at the site of use? In assessing the suitability of materials (and hence waste status) one has to consider not only the circumstances in which they arise but also the circumstances in which they are to be used. When considering “Site of Origin” scenarios, an acceptable level of risk to the environment is defined in the context of the sites current/baseline condition. This enables the re-use of otherwise contaminated materials on the basis of waste minimisation; land quality is being maintained or enhanced, thus achieving the objectives of the Waste Framework Directive. When considering the importation of foreign materials to a site it is important to ensure that the materials will be used in a way that achieves the same goals. If materials were imported to a site so that new hazards were created, or existing hazards increased the net effect would be to increase the level of risk posed to human health and the environment. This would be contrary to the objectives of the waste framework directive. It should be remembered that land-use can and does change over time meaning that any new hazards created by importation of materials will have to be dealt with in due course. The net effect is that land quality would have been degraded rather than maintained or enhanced; this is not considered sustainable. The differential between the costs of disposal of hazardous vs. non-hazardous materials also make it attractive to criminals to undertake “sham recovery” operations whereby the development itself is secondary to the profits to be made in circumventing legal controls on disposal. By providing clear guidance in the DoWCoP regarding such matters the Environment Agency hope to dissuade its potential exploitation in this manner. How should I approach the assessment of chemical suitability in Cluster Projects given the restrictions imposed on reuse highlighted in Watchpoint 15? Define the quality of the material you need at your receiver site by reference to a site specific risk assessment as normal. Remember that in order to be suitable, materials must not cause pollution or harm to human health / environment (including controlled waters) at the location where they are to be used. Check whether the values derived would fall above the current thresholds used for hazardous waste classification purposes. If any of the values are above these thresholds then alter the materials specification to limit the allowable levels of these substances to below the thresholds. In most cases this conservative approach will be sufficient to prevent the importation and reuse of materials in a way that the Regulator may consider to be “Sham Recovery”. It should also prevent the inadvertent creation of any significant problems for any future regeneration of the site. In the unlikely event that the concentration of some substances at the receiver site are already above the hazardous waste classification thresholds but are not posing any unacceptable risks (as demonstrated by your site specific risk assessment agreed with the regulators), then raise the issue with the Environment Agency when seeking approval for the Cluster Project. In exceptional circumstances you may be allowed to import materials with levels of substances equal to or below the levels already existing at the receiver site. To do this the Environment Agency will need to be satisfied that the proposal is not unnecessarily substituting hazardous materials for non-hazardous alternatives (i.e. Sham Recovery). Why is there not a short form Materials Management Plan for small volumes of lower risk materials? The new Materials Management Plan form is designed to be used for all scenarios covered by the DoWCoP. Not all fields within the form need to be completed for every scenario. Why is the term ‘adequate site investigation’ used over ‘ground investigation’? Version 1 of the DoWCoP stated “comprehensive Site Investigation” which was considered too onerous for every site, for example at some sites no investigation would be necessary. However, in other situations more than just a Ground Investigation will be required e.g. Desk Top Study, therefore the steering group suggested the term “adequate Site Investigation” as an appropriate compromise. Does the Qualified Person need to check that the treatment contractor has appropriate licences in place? Does placing of material beneath cover layers amount to discarding of waste? Material placed beneath buildings and hard standing such as car parks and roads within the land being developed is not waste, if the material is demonstrated to be non-waste by evidence of suitability for use and the works are carried out in accordance with the requirements of the CoP. Where there is any dispute regarding the use of material in this way then readers are referred to the Environment Agency guidance “Defining Waste Recovery: Permanent Deposit of Waste on Land”. Is material a waste if it is placed in or on the ground and has to be contained to prevent harm to human health or the environment? Where excavated material is not suitable for the proposed use it will be waste and hence the CoP will not be applicable. For example if the material has to be placed in an engineered cell and managed to prevent harm to human health or pollution of the environment then this would be viewed as having been discarded as waste. This will be a landfill and require an environmental permit. There is a distinction between this scenario and that relating to cover layers above. Why does the Code of Practice make no distinction between contaminated and uncontaminated material? The need to distinguish between “contaminated” and “uncontaminated” soils is no longer considered necessary. These are self-defining terms on a site specific basis having regard to the risk assessment, e.g. some soil may not be considered contaminated for a given land use, but would be for a more sensitive land use, on the same site. Is recovered aggregate a waste if it is produced in accordance with the WRAP "Quality Protocol for the production of aggregates from inert waste"? No it is not likely to be waste. Typical uses of recovered aggregate include pipe-bedding and selected backfill to sewer excavations; carriageway sub-base construction; and the construction of vertical, granular filled drains to aid consolidation of compressible clays. Is the installation of a barrier to prevent groundwater movement or contain contaminants a waste activity? Bentonite slurry cut-off walls: Bentonite / cement slurries are used to construct vertical barriers in the ground to prevent groundwater movement or to contain contaminants. Depending upon the site-specific circumstances, this would either not require an Environmental permit or may comply with the EA Enforcement Prosecution Policy Functional Guidelines. Reference should be made to the EA Remediation Position Statement Guidance for details. Are soil improvement techniques treatment activities and do they require a permit? Lime/Cement Stabilisation: Stabilisation of soils with high moisture content to improve their compaction characteristics by mixing with lime-cement or cement only. If the lime is considered to be a waste material, or if the treatment is required specifically to recover a discarded material this may need to be reconsidered. Vibro Compaction: Vibratory techniques to improve the bearing capacity of weak soils (often made ground). These techniques use a vibratory poker that is lowered into the ground under its own weight. In most cases, stone is introduced into the ground either down the centre of the poker or into the hole when the poker is removed. The poker applies further compactive effort until adequate resistance is achieved. The combined affects of the vibration and the introduction of the stone result in an increase in the density of the soil and a consequent improvement in bearing capacity. This activity must be carried out in accordance with requirements of the EA published guidance "Piling and Penetrative Ground Improvement Methods on Land Affected by contamination: Guidance on Pollution Prevention. NC/99/73". Dynamic compaction: This technique involves dropping a heavy weight from considerable height to compact weak soils (often made ground). A series of ‘footprints’ are formed which are subsequently filled with granular fill. This may either be a primary aggregate or a re-cycled material. Dynamic compaction is not a waste treatment activity (unless it is being done on a landfill site for example) and any risk to controlled waters must be addressed during the assessment of the Planning permission. Surcharging: This technique involves placing soils in a mound to compress weak soils thus reducing future settlement potential. If the material used for the surcharging is generated and then reused (in line with the CoP) on the site it should not require a WFD permit or Exemption. However if the material is to be imported or exported from the site after use there may be requirements for waste permitting. Piling: There are various forms of piling which are used to transfer structural loads through weak soils to more competent materials at depth. These range from driven displacement, bored and continuous flight auger bored piles. A WFD permit will not be required for this activity. The piling activity must be carried out in accordance with requirements of the EA published guidance "Piling and Penetrative ground Improvement Methods on Land Affected by contamination: Guidance on Pollution Prevention. NC/99/73". Soil Reinforcement: This technique involves the introduction of geo-textiles or ‘geogrids’ to layers of soil (often made ground) to improve load distribution and bearing capacity. This technique is also often applied to improve the slope stability of soils to facilitate construction of steep sided embankments. A variation, to improve the stability of cuttings, is the use of ‘soil nailing’ whereby rods are ‘fired’ into the ground at regular intervals. In certain DoW CoP scenarios liaison with the regulators is either required or the most appropriate option. This liaison DOES NOT require the EA or NRW officers to assess / read / approve MMPs. It provides an opportunity for projects to flag the sites intentions to use the DoW CoP and for the regulators to share any concerns they have about the site, operator or neighbourhood. For reuse on Site of Origin of non-naturally occurring materials the EA / NRW do their responses through the normal planning matrix process on reports, remediation strategies etc. EA / NRW Waste teams and / or GWCL teams should just check, if treatment is involved, that a MTP is deployed appropriately. EA / NRW Waste officers do not always require consultation for direct transfers of clean naturally occurring materials between two sites, if there is a clearly referenced desk study or site investigation report which confirms the site has no previous contamination issues. The QP is required to review and confirm this by providing the document reference in the Declaration. Consultation is required for Cluster projects to agree the donor sites and receivers sites ahead of any transfers. This is just agreeing the sites, location and timeframes NOT the MMPs. The regulators may ask to see MMPs if they so wish. The DoWCoP scope excludes “excavated infrastructure material such as pipework and storage tanks” Does this exclude the use of excavated infrastructure such as road bases, car parking areas etc…? And if this is the case will operators need to use the DoWCoP and the WRAP Aggregates Quality Protocol on the same site? The Environment Agency’s concerns centre on potentially polluting substances that can be associated with infrastructure e.g. pipes and tanks that may have residue products within them, concrete with adhered asbestos etc…. Other excavated infrastructure can be reused under the DoWCoP on the Site of Origin and receiver sites within a Cluster. If fully complied with the Aggregates Protocol allows for inert materials to be used at any site, including those currently not within the scope of the DoWCoP. Why did a DoWCoP emerge from this process rather than a BREW Quality Protocol for soils? BREW looked at this, but it was felt that the inherent multifunctionality elements of the programme contradicted the Government's suitable for use and risk based approach. The recommendation from that work was to build upon the Environment Agency guidance “Definition of Waste: Developing on Greenfield and Brownfield sites”, which the DoWCoP does. There is no single definition of what is "clean" that can be provided for soil that would allow it to be used at all sites and in all circumstances, unless of course it is inert and linked to a Quality Protocol. I trained and was registered as a Qualified Person under version one of the Definition of Waste Code of Practice. Can I re-register as a Qualified Person for the current version of the DoWCoP? No. Individuals will, as of January 2013 be expected to attend the one day training course again. This is required due to the amount of time which has passed since the versions changed. For the on-site reuse scenario the Qualified Person submits the Declaration to the Environment Agency and then excavation begins. For Cluster projects the Environment Agency still wants to agree the point that treated materials cease to be waste on a project by project basis. At what point in the process should these discussions take place? What information needs to be submitted to get this agreement? Why is there a need to consult with the Environment Agency and Local Authority if contamination is not suspected i.e. a project progressed via Route B of the DoWCoP. Given that there is no suspicion of contamination there should be no need to consult. The Qualified Persons should satisfy themselves prior to signing the Declaration that there is evidence to support this e.g. Desk Top Study. It will be good practice for the Qualified Person to include a clear request to see all relevant documents and to record those documents provided to them that formed the basis for the signed Declaration. It would be prudent to have a “full disclosure” clause in any contractual agreement between the Qualified Person and the person commissioning the works. Under Route B – Direct Transfer – would there now be a need to consult? Liaison with regulatory authorities regarding any development should continue as normal (e.g. discussions with local planning authority etc.) however there is no need to specifically consult the Environment Agency / Local Authority about remediation objectives or suitability of materials if such materials fit the description set out in Appendix 2 of the DoWCoP relating to Direct Transfer. How does the Qualified Person know that there are “no objections”, as stated in the Declaration, from the Environment Agency or Local Authority, particularly if they are not expected to enter into dialogue with them? Actual correspondence (e.g. letters, e-mails, minutes of a meeting etc…) clearing stating this. Correspondence showing that the regulator has been approached but has declined to comment in detail on the proposal or has provided generic advice only. Correspondence showing that a real attempt has been made to engage with the regulator but that no response has been received (a minimum 21 day period should have elapsed before this could be demonstrated). The planning permission provides a clear link to the approved Remediation Strategy (where planning is applicable). Desk Top Study clearly indicates that no contamination is suspected, hence no need for consultation (see FAQ 9a above) and therefore it is reasonable to conclude that there is no objection in relation to the use of the materials in accordance with the Material Management Plan. The planning permission provides a clear link to how the materials are to be dealt with (where planning is applicable). The Design Statement clearly sets out how the materials are to be dealt with and the Statement has been agreed e.g. correspondence, minutes or there is a clear link from a planning permission (where planning is applicable). There is some confusion over the subject of “agreement” and reference to the “no objections” statement in the Declaration. It is the Declaration wording that is most important. The reference to “no objections” is relevant to objections to waste management issues and the detail of the DoWCoP documentation – rather than objections to other aspects of a planning submission e.g. flooding. What is the distinction between reviewing and checking (in the context of Qualified Person actions)? Reviewing in this context means making sure that all documents are there and that e.g. risk assessment conclusions align with specification and the Remediation Strategy. Checking means working through the risk assessment, for example, to check that conclusions are right – this is deliberately not required in the DoWCoP as the Qualified Person would be straying into territory of others. The Steering Group did not want to have work paid for twice and did not want confusion in relation to roles and responsibilities. It was a deliberate decision to limit the role of the Qualified Person and hence liabilities remain as they were before the introduction of the DoWCoP. Does the Qualified Person just check the existence and conclusions of the Risk Assessment not the detail? Yes. The role of the Qualified Person is deliberately limited to that set out in the DoWCoP. If the Qualified Person was to come across any fundamental error in any of the documentation (this is not just restricted to the Risk Assessment) then it is expected they would raise the issue with the person who commissioned them as a Qualified Person. However that would be done outside of the requirements of acting as a Qualified Person. Contracts can be extremely large, to what depth should they be reviewed? How long will the process (production of Declaration) take and what will it cost? This will depend on the complexity of the project, how the information is to be presented and the market rate of the individual Qualified Person. How rigidly will the DoWCoP Qualified Person requirements be applied e.g. will there be flexibility if someone has more than adequate experience, but is not chartered? Chartered status is required. Experience and chartered status are tackling two different aspects. Chartered status supports the statements made in the DoWCoP relating to self-regulation and a high level of professional integrity. That is not to say that the criteria may not change in the future following a sufficient period of the DoWCoP being used. Note that in terms of experience Qualified Persons should have a track record in site investigation / remediation and waste management issues. Can a Specialist in Land Condition (SiLC) act as a Qualified Person? Yes provided that they attended a recognised training course, and meet the other requirements, such as registration set out in Appendix 6 of the DoWCoP. The DoWCoP (Appendix 6) states that the Qualified Person should not be directly involved in the management or execution of the project. Is it acceptable for the Qualified Person to have had some direct role in the early stages of the project (e.g. management of site investigations or setting up the project under planning) and equally – could a Qualified Person become involved in project management or execution once the Declaration is completed and signed? There should be no possibility of Qualified Persons checking their own work. As such, it is considered that any direct involvement in the initial stages of the project, or its establishment, will exclude someone from acting in the Qualified Person role on that project. Once the Declaration is completed, signed and submitted, the Qualified Person role is finished and that person could go on to take a direct role in the management and execution of the project. Note, however, that in a Cluster project, there may be a number of Declarations to be completed and also the possibility of adding to that number if further sites join the Cluster. If the Qualified Person has become involved in the management and execution of the Cluster project having completed the initial Declaration(s) then a new Qualified Person will be required to deal with such additions. No. The system has been established for those who intend to operate under the DoWCoP and recover excavated materials. What happens to Declarations when received at CL:AIRE? All Declarations are added to CL:AIRE Declaration management system. Submissions are checked for mistakes or missing entries. Once all required information is included, CL:AIRE issue a Declaration receipt to the Qualified Person. This carries a copy of the submitted information and is copied in to either the Environment Agency or Natural Resources Wales. The regulators add the information to their respective systems which informs local area teams. Is it recommended to send a further copy of the Declaration to the local office of the Environment Agency? No, neither required nor desirable. The Environment Agency will disseminate and manage decisions regarding audits etc. from the centre. When will the more formalised arrangements for the Qualified Person to be registered be enacted? CL:AIRE is the recognised Registration Body. Details of those requesting to be registered as a Qualified Person should complete the Qualified Person Declaration and submit it to CL:AIRE who will administer applications of those wanting to become a Qualified Person. Can the Qualified Person change their mind over a submitted Declaration if new information comes to light? There is no requirement for the Qualified Person to be further involved with the project once the Declaration is submitted. There is no mechanism for retracting a Declaration within the DoWCoP, even when there is a material change to the project. It is important that people involved with the excavation and reuse of materials understand the requirements of the DoWCoP e.g. they would be responsible for amending the Materials Management Plan and recording what actually happened to that material in the Verification Report. Are there any long term liabilities that may arise from the actual use of unsuitable material to the Qualified Person who signed the Declaration? No – liabilities remain as they currently are without the use of the DoWCoP. The Qualified Person is signing the Declaration confirming everything is in place. The actual use of materials outside of the agreed specification would occur after the Qualified Person’s involvement. If a Qualified Person is found to have fraudulently completed a DoWCoP Declaration then their registration will be reviewed. Will the Environment Agency acknowledge receipt of Declarations? The Environment Agency has revised their position and an acknowledgement will be sent after submission of the Declaration. What records should the Qualified Person keep? The Qualified Person should keep a record of all of the documents that were provided to them for review. How far back do you go in relation to the “relevant individual convictions” exclusion for Qualified Person’s status? Could an individual acting as a peer reviewer of certain aspects of the project act as Qualified Person? Yes. Provided that it was strictly review, with no detailed involvement. Independence from the running of the project would need to be clearly demonstrated. Why were extra questions added to the Declaration in October 2016 e.g. applications for recovery permits & contractual arrangements? Enquire whether the project has been the subject of an application for a deposit for recovery permit and if so whether that application (or preceding waste recovery plan proposal) was refused. Establish and record the contractual relationship in place between the supplier and recipient of soil materials. This requirement arrives from the outcomes of the Tarmac Aggregates Ltd v The Secretary of State for Env. Food & Rural Affairs & Anor (2015). The Court of Appeal found against the EA in its refusal to grant a Standard Rules Permit for recovery. The outcome was based on the fact the works would have occurred even if use of non-waste materials were required. There was discussion during the case of the Wallasea Island project which was granted a recovery permit, despite the fact it could not prove the same e.g. the project would not have been feasible without a recovery permit. This case suggests the EA may have erred in granting the recovery permit to Wallasea Island, in which case it would be considered a waste disposal operation. It follows that a projects viability without reuse of waste materials in place of primary materials becomes critical and precedes any attempt to define materials as a non-waste e.g. applying the DoW CoP. Project teams are advised consider how they can summarise and prove a projects viability at the earliest possible stage to support the Qualified Person review. This might be most easily achieved by showing that planning decisions prove the need for the materials and that the project would be financially viable if primary materials had to be used to source the required volumes. How do I renew my QP registration? All Qualified Persons should already have a website login. Check your profile (click “Update My Profile” from the Actions box on the top left of your Dashboard) and ensure your details are fully up-to-date. Click “Renew QP Registration” from the Actions box on your Dashboard. Check your contact details before confirming the status statement. If anything is incorrect please click the ‘My Profile’ hyperlink as instructed and confirm the Declaration. Ensure you upload documentary evidence of active Chartered status (e.g. copy of subscription receipt). Once all details are up-to-date and you have confirmed no change in your professional status, click on “Add to Cart” and complete the purchase of your renewal. You will be given the option to enter a Purchase order but this is not mandatory. Payments can be made by BACS (details are on the invoice) or immediately online by credit card via PayPal (no PayPal account required). If you wish to pay by credit card over the telephone, choose the invoice payment option and call our Accounts Department between 10 am and 2 pm Mon to Fri. Completing the purchase process will create an invoice. Material placed beneath buildings and hard standing such as car parks and roads within the land being developed is not waste, if the material is demonstrated to be non-waste by evidence of suitability for use and the works are carried out in accordance with the requirements of the CoP. Where there is any dispute regarding the use of material in this way then readers are referred to the Environment Agency guidance “Defining Waste Recovery: Permanent Deposit of Waste on Land”. No it is not likely to be waste. Typical uses of recovered aggregate include pipe bedding and selected backfill to sewer excavations; carriageway sub-base construction; and the construction of vertical, granular filled drains to aid consolidation of compressible clays. Bentonite slurry cut-off walls: Bentonite / cement slurries are used to construct vertical barriers in the ground to prevent groundwater movement or to contain contaminants. Depending upon the site-specific circumstances, this would either not require an Environmental permit or may comply with the EA Enforcement Prosecution Policy Functional Guidelines. Reference should be made to the EA Remediation Position Statement Guidance for details. Lime/Cement Stabilisation: Stabilisation of soils with high moisture content to improve their compaction characteristics by mixing with lime cement or cement only. If the lime is considered to be a waste material, or if the treatment is required specifically to recover a discarded material this may need to be reconsidered. Vibro Compaction: Vibratory techniques to improve the bearing capacity of weak soils (often made ground). These techniques use a vibratory poker that is lowered into the ground under its own weight. In most cases, stone is introduced into the ground either down the centre of the poker or into the hole when the poker is removed. The poker applies further compactive effort until adequate resistance is achieved. The combined effects of the vibration and the introduction of the stone result in an increase in the density of the soil and a consequent improvement in bearing capacity. This activity must be carried out in accordance with requirements of the EA published guidance "Piling and Penetrative Ground Improvement Methods on Land Affected by contamination: Guidance on Pollution Prevention. NC/99/73". Dynamic Compaction: This technique involves dropping a heavy weight from considerable height to compact weak soils (often made ground). A series of ‘footprints’ are formed which are subsequently filled with granular fill. This may either be a primary aggregate or a recycled material. Dynamic compaction is not a waste treatment activity (unless it is being done on a landfill site for example) and any risk to controlled waters must be addressed during the assessment of the Planning permission. Surcharging: This technique involves placing soils in a mound to compress weak soils thus reducing future settlement potential. If the material used for the surcharging is generated and then reused (in line with the CoP) on the site it should not require a WFD permit or Exemption. However, if the material is to be imported or exported from the site after use there may be requirements for waste permitting. Soil Reinforcement: This technique involves the introduction of geotextiles or ‘geogrids’ to layers of soil (often made ground) to improve load distribution and bearing capacity. This technique is also often applied to improve the slope stability of soils to facilitate construction of steep sided embankments. A variation, to improve the stability of cuttings, is the use of ‘soil nailing’ whereby rods are ‘fired’ into the ground at regular intervals. Reinforced Concrete Raft Foundations: This is a common foundation solution used on weak or potentially expansive soils. Certain ground conditions, in particular expansive clay soils require the foundation to be constructed on a bed of compacted granular material made from primary aggregate. Does de-watering of an excavation require a permit? The removal of more than or equal to 20m3 /day water may require the granting of an Abstraction Licence under the Water Resources Act 1990. However, the current Environment Agency position is not to require a permit for pumping water that has gathered in an excavation if the water is to be disposed of solely to prevent interference with building operations. Any changes to this position will be publicized via the EA or DEFRA websites. Dewatering of excavations: Where extractions have to penetrate below standing groundwater levels, dewatering will be required. A number of techniques ranging from sump pumping, to the use of external well points or deep wells can be used. Discharge of the pumped water may require a permit but the activity does not fall within the remit of the WFD. Infiltration Drainage: Sustainable urban drainage solutions (SUDS) often call for infiltration of collected surface water to maintain surface water discharges from a developed site as closely as possible to the rates prior to development. This can occur on greenfield and brownfield sites, although we would not encourage this on contaminated sites. Discharge consents may be required but these activities do not fall within the WFD. Can a Cluster involve 2 sites only? Yes - That is the simplest Cluster model. Does the Hub site need to be covered by an Environmental Permit? Given the Hub site has an Environmental Permit can the site be used at the same time to treat hazardous waste to non-hazardous waste? Yes – provided the Environmental Permit allows for that particular treatment and that the wastes are adequately separated from treated materials associated with the Cluster project. Any particular activity must not extend beyond what was reasonable for the Cluster project, remembering that Cluster is a temporary activity. Is the Sheffield pilot Cluster project written up in any form? No, but the work on it has fed into the DoWCoP and the Cluster Guide. Does material need to be treated at the Hub site or could it just go in and then out to a site where it is suitable for use? Yes it could pass through the Hub site without treatment if all in line with the DoWCoP i.e. suitable for use is just one factor that has to be satisfied. The rationale for this is that the Hub site operator becomes the holder of the waste as it is accepted at the Hub site. As the holder of waste the Hub site operator can not allow it to leave the site as non-waste unless he/she is satisfied that the DoWCoP has been followed in relation to the receiving development site. What happens if out of specification material is received at a Receiver site? It should be returned to the Hub site (see DoWCoP paragraph A3.13). It would be prudent to use a registered waste carrier in transporting non-wastes from the Hub site to aid in this scenario i.e. it is easier to raise Duty of Care transfer notes than enter in to a new contract with a registered waste carrier to return the load. (There is no need to use transfer notes for material considered to be non-waste – it is recommended that you do not use transfer notes as Delivery tickets). Can material with different contaminant concentrations be blended? Yes to facilitate treatment, but not for disposal. Blending should only be for operational reasons, not to achieve dilution. Is material waste while in stockpile on the Hub site? Yes – before and after treatment. It can cease to be waste upon other DoWCoP criteria also being satisfied (see Watch Point 16). If a Cluster was established and operating, when an opportunist site appeared, should the introduction of the new site be discussed with the Environment Agency? Yes. The Cluster concept recognises that opportunist sites may appear once the Hub site is established and provides a lower cost opportunity for developing land, this may include Donor and / or Receiver sites. The defined Cluster project would then have to be re-defined to include the opportunist site (or sites). See Watch Point 17. The exercise within the CL:AIRE one day training resulted in a surplus of material located at the Hub site. Would the Environment Agency agree to such a proposed Cluster project? Yes – provided the contingency arrangements and contracts identify who is responsible for it, what will happen to it and that sufficient funds are in place to deal with it satisfactorily. The mass balance across the sites needs to aim for this surplus amount to be as small as possible in the first instance (see paragraph A3.10). The Cluster concept recognises that new sites may be subsequently added to a project and this can include an additional Receiver site that has a need for it. How would the DoWCoP be applied to a phased project where material from one phase may not be returned until a subsequent phase? This would hinge on the certainty of use and the time scale involved, but does fit within the scope of the DoWCoP. The Materials Management Plan should clearly identify the phased approach. How do the economics get arranged, i.e. price for treatment at Hub and “value” of material delivered to Receiver? It is determined on the basis of the local market and contractual arrangements (including risk and profit sharing). Can I transfer materials which are above hazardous waste thresholds? Set your specification for suitability based upon a site specific risk assessment for the receiver site. Check whether or not the levels of any contaminants in that spec are above hazardous waste thresholds. If they are then modify the specification to reduce the acceptable level for those contaminants to below the hazardous waste threshold. Does the CPD activity have to be specifically related to the DoW CoP? This log must reflect a minimum of 30 hrs spent on the planning, management, regulation or oversight of DoW CoP, remediation or other projects involving materials management. In the ‘View My CPD Log’ screen I see that there is an excel file that can be downloaded. Is this the format in which you require individuals CPD logs to be completed? No. You can upload a file in .xls, .doc, .pdf, .csv format. The excel button provided enables you to download / export your log if you need it for other purposes. What is the timescale for completing the CPD log in relation to the QP renewal date and exam completion date? The timescales are not linked. Continuing professional development (CPD) is a commitment to continually update your skills and knowledge in order to remain professionally competent. All professionals should undertake and record CPD activity each calendar year. For those who are Chartered, their Professional Institute will set a minimum requirement of hours or points per year. The CL:AIRE system can be used and exported for submission to Professional Institutions. To maintain their QP status, QPs need to log a minimum of 30 hrs per year e.g within 2019. As a QP, when should I start recording my CPD? Start recording/uploading your CPD for DoWCoP QP puposes from 2019. There is no need to retrospectively upload for 2018, though you can if you want to. Is the Verification Report the same as that prepared for other purposes? Contaminated land practitioners think of a document that has a much wider scope. The DoWCoP relates specifically to the reuse of excavated materials and demonstrating how the reuse has achieved or furthered the objectives relating to that use. In relation to the DoWCoP it is anticipated that it is a subset, or specific section, of a verification report. For the Design Statement route (where contamination is not suspected) it may only cover the reuse of excavated materials and nothing else. It is a new requirement for these types of projects (it is anticipated that it will be a very small document). Is the Verification Report sent to the Environment Agency? No. The Environment Agency does not require the submission of the Verification Report. However, they may request to see a copy in carrying out an audit. Does Verification Report need to include a requirement for ongoing monitoring? Not in the context of the section of the Verification Report that deals with materials handling under the DoWCoP. It may do elsewhere for other reasons. Does certainty have to be demonstrated by planning permission? No – that is just one route. The planning permission can be seen as a key piece of the picture, but it is a complete picture that has to be developed. There may be sites where no planning permission is involved e.g. remediation following a chemical spill. The agreed Remediation Strategy would be the key piece of evidence. Other lines of evidence would include contracts and Design Statements. Is material that meets specification and reused non waste, even if it would be classified as hazardous waste if sent off site for disposal? Correct – If appropriate volumes are suitable and certain to be used and would not cause pollution of the environment or harm to human health. If it is not waste there is no need to classify it as inert, non- hazardous or hazardous. If excavated contaminated ash was reused, would this still be legally waste? If material requires some work to meet geotechnical properties what happens? Refer to the Environment Agency FAQs webpage. If material is used as suitable for one use (e.g. commercial/industrial), under the DoWCoP and a later development has a more exacting standard for which it would not have been suitable (e.g. houses/gardens) does it revert to its waste status? No. The material has by that time been fully incorporated into the earthworks and hence is fully recovered. The question is then whether the holder of that land discards it again. Can material be stockpiled on site for use in a later phase of project if using the DoWCoP? If the stockpile is anticipated to be in place for longer than 12 months then agreement from Environment Agency should be sought (see DoWCoP paragraph 4.1). The longer the storage time the less “certainty” of reuse. How do the Site Waste Management Plans and DoWCoP overlap? If the project relates solely to the earthworks, the Materials Management Plan will in essence cover the bulk of the requirements of a Site Waste Management Plan (to be compliant with the Site Waste Management Plans requirements the Materials Management Plan would have to be top and tailed). Where the project is larger than just earthworks, the detail within the Materials Management Plan would be a subset of the Site Waste Management Plans i.e. dealing with one waste stream – excavated arisings). On a Greenfield site, covered by a Site Waste Management Plan, why use the DoWCoP and add further bureaucracy? When is the Verification Report due and where must they be sent? In line with the proposal under Version 3 of the DoW CoP and following the findings of project audits, the EA & NRW have requested CL:AIRE bring forward the requirements for project teams to submit their Verification Reports to ensure the full DoW CoP process in complete, therefore from January 2018, there is a requirement for project teams to estimate the expected production date of the Verification Report and for this date to be entered into the Declaration. A reminder email will be sent to the person identified in the Declaration if the initial due date specified is missed. Instructions in this email will indicate where to upload the Verification Report or, if it is not yet ready, to change the due date. CL:AIRE understands that the due date may be difficult to estimate, however project teams should be reminded to maintain good levels of communications with CL:AIRE on expected progress by changing the due date. If expected Verification Report production dates are missed and no communication is received from the project team, CL:AIRE will make contact with the named individual or organisation to request an update. How can the model output interval be varied (i.e. time interval at which solute concentration/ NAPL thickness/ piezometric contours are reported)? The “GWSDAT options” dialogue box, which appears when “GWSDAT analysis” is selected, allows the user to select the time interval between spatiotemporal model output plots. The pre-defined user options are “None”, “Monthly” or “Quarterly”: the model sets the start and end dates for the intervals by working backwards from the most recent sampling date. Concentration contour plots are generated by exporting data from the spatiotemporal model at the end of each specified time interval. The “GWSDAT options” dialogue box also controls the handling of groundwater elevation data. If no aggregation (i.e. “None”) is selected then the software will attempt to generate a groundwater contour plan for every date in the input dataset. In practice, however, groundwater elevation surveys are often spread over a number of days and so this approach is likely to generate incomplete contour plots. If “monthly” or “quarterly” aggregation selected the software collates daily groundwater elevation data into monthly or quarterly blocks, thereby increasing the size of the dataset available for piezometric contouring. How are solute concentration contours generated? Solute concentration contours are generated using a spatiotemporal smoother algorithm, which fits a model to the solute concentration distribution through space (XY well coordinates) and time. This does not involve any temporal collation of the input concentration dataset. For further details refer to GWSDAT software manual. How are groundwater piezometric contours generated? Piezometric contours are generated using an adaptive kriging algorithm. The degree of flexibility allowed by the kriging algorithm is a function of the number of groundwater elevation data points in the selected model output interval, which improves the contour quality for smaller datasets. How does the software scale the concentration contour/ circle plots? Solute concentration contour plots have default logarithmic scales of 0 to >50,000 ng/L, 0 to >5000 ug/L or 0 to > 500 mg/L, dependent on the units selected. The concentration scale is fixed so that contour plots for successive time slices are directly comparable. The user can, however, select to “scale colours to data” to produce a colour key scaled to the concentration range for each model output interval. For the individual well trend plots, what is the advantage of using nonparametric statistics over traditional linear regression techniques (monotonic trend fitting approaches)? The use of non- parametric statistics allows the analysis of cyclical trends in groundwater solute concentrations (e.g. concentrations that increase and decrease through time). For example the Mann Kendal function, which is commonly used to evaluate trends in groundwater solute concentrations, is a monotonic function that cannot fit cyclical variation/ short term fluctuations. Why do cells in the trend/ threshold indicator matrix sometimes switch to grey? Cells in the trend/ threshold indictor matrix will switch to grey in the event that the concentration trend cannot be calculated because there is insufficient data, or if confidence in the trend smoother estimate is poor. Regions of poor confidence in the trend fit are indicated where the trend smoother and 95% confidence limit curves are coloured grey, rather than blue, on the well trend plot. Regions of poor confidence are defined as where the upper 95% confidence limit (dashed blue/ grey line) exceeds 10x the trend fit value (solid blue line). When “Threshold statistical” is selected in the trend/ threshold matrix display table, why do cells in the indicator matrix sometimes indicate red (above threshold) when the measured concentration at that time point is below the threshold limit? Cells in the threshold indictor matrix switch colour dependent on the value of the upper 95% confidence limit relative to the user specified threshold concentrations. So, for example, a threshold matrix cell will only switch from red to green when the upper 95% confidence limit of the trend fit is below the user specified threshold concentration. The user can compare measured concentration data directly against the user specified threshold values by choosing the “Threshold absolute” option in the trend matrix display table. This option is useful for highlighting any one-off measurements that exceed the concentration threshold but are not statistically significant. The user can then determine if it is worthwhile collecting additional data to validate the result. 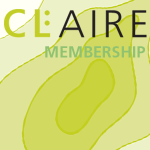 What is the process for renewing CL:AIRE Membership? Your invoice is available if you hover over "Book or Buy > My Orders" and payment can be made over the phone by credit card or by BACS. What is the Gas Protection Verification Accreditation Scheme? This scheme seeks to raise standards in membrane verification and provide all stakeholders involved in land contamination management with enough confidence that risks associated with ground gases have been adequately managed. Is the scheme designed to be used throughout the UK? It will be recommended to be used in England, Scotland, Wales and Northern Ireland. Further discussions will be held with regulatory bodies. The scheme is voluntary; however, we anticipate that some regulators and clients will start to signpost to the scheme as a way of demonstrating competence for individuals preparing gas protection verification reports. It is anticipated that the economic advantages to the developer/client of getting their proposals “right first time” will create the driver to use the scheme. The more projects that use the scheme, the more time will be freed up for Regulator(s) to spend their limited resource to scrutinise and challenge substandard applications. This in turn will create the incentive for companies to employ the scheme next time. There are a number of existing registers of individuals and the purpose of this register is to enable consumers to identify capable people in the field of gas membrane verification. This scheme will dovetail with the National Quality Mark Scheme for Land Contamination as it will enable SQPs to identify competent professionals working in the field of gas verification. How would you apply a Declaration if a project is in multiple phases? An individual declaration would be purchased by the accredited gas verifiers to append to each verification report that is submitted to a local authority. If the project is delivered in phases, a declaration is purchased for each stage of project. What is a Gas Verification Qualified Person (GVQP)? A GVQP is an experienced professional that has been assessed as competent under the Gas Verification Accreditation Scheme. Why is the declaration proposed to be held by the GVQP rather than the Company? The scheme relies upon the integrity of an individual to prepare the verification reports, therefore it makes sense for them to hold the authority to apply the quality mark. Will CL:AIRE be the awarding body for GVQP status? Yes. CL:AIRE plans to work with industry experts who will act as scrutineers. These scrutineers will also be required to be assessed against the capabilities. What happens after you get awarded GVQP status? CL:AIRE will inform you that you have been successful and you will be directed to the Gas Verification website and CL:AIRE will award you your individual GVQP number. This will then be displayed on the register against your name. How do I become a GVQP? You need to meet the eligibility criteria and follow the submission process. If all your documentation is correct, then your application will proceed for assessment and interview. How do I check/verify if a person who says that they are GVQP is correct? All current GVQPs will be listed on the dedicated website. What is the purpose of the declaration of compliance? The certificate will provide confidence to the regulator that a GVQP has prepared a gas verification report in accordance with industry standards. What if I have feedback/complaint/comment/observation about a GVQP? Feedback about a GVQP will be possible through the dedicated website. Can an GVQP from a company sign off a different companies work? Yes an GVQP from one company can sign off a verification report from another company and sign and append a declaration of compliance. The GVQP must satisfy themselves that the quality of the report meets the standards as their signature will be confirming its compliance.